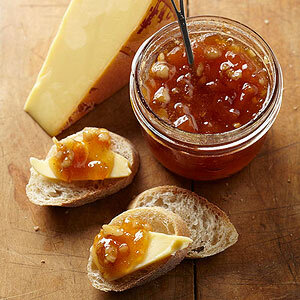 Lemon, nutmeg and walnuts add layered flavor and texture to this unusual jam. This recipe comes from the Glass Rooster Cannery cooking school and farm store in Sunbury, Ohio. Place cantaloupe and peaches in a 6-quart heavy pot. Bring to a boil over high heat, reduce heat and simmer, uncovered, for 20 minutes. Add sugar. Bring to a boil, reduce heat and simmer, uncovered, for 30 minutes or until mixture is thick and jam sheets off a metal spoon*. Stir in lemon juice, walnuts, lemon zest, nutmeg and salt. Ladle hot jam into hot, sterlized half-pint canning jars, leaving 1/4-inch headspace. Wipe jar rims; adjust lids. Process filled jars in a boiling-water canner for 5 minutes (start timing when water returns to boiling). Remove jars; cool on wire racks.